Redefining the kilogram; exotic interconnects; nanotube plugs. In 2011, the General Conference on Weights and Measures approved a plan to redefine the kilogram and other measurement units. The new definition for the kilogram will be based on the fixed numerical values of Planck’s constant (h), according to the National Institute of Standards and Technology (NIST), part of the U.S. Department of Commerce. NIST has taken steps to help accelerate the redefinition of the kilogram. Originally defined in 1875, the kilogram is the only SI unit that is still described as an artifact rather than a fundamental physical property. To help redefine the kilogram, NIST has refurbished its older watt balance—the NIST-3. The balance is a two-story-high system designed to define mass. Researchers replaced the knife-edge on the balance beam, which upgraded the programmable Josephson voltage standard system. Today, watt-balance measurements of h are made by using a precisely known mass. In the redefinition, the kilogram mass will be realized by using a fixed value of Planck’s constant. The revamped NIST-3 has been used to obtain the latest measured value of Planck’s constant–the first to be released since 2007. The new result, 6.626 069 79 x 10(-34) J•s (with an uncertainty of 30 in the last two digits), differs from the 2007 value, according to NIST. But the international community must gain a consensus value of h. At least three independent experiments must produce values with a relative standard uncertainty of no more than 50 parts in 109. One of them must have an uncertainty of 20 parts in 109 or better. And watt-balance results must be reconciled with an alternative method, which involves counting atoms in an ultra-pure sphere of silicon, according to NIST. It’s possible that there could be discrepant values from the other proposed balances in the world. This includes a new balance being developed at NIST, dubbed the NIST-4. 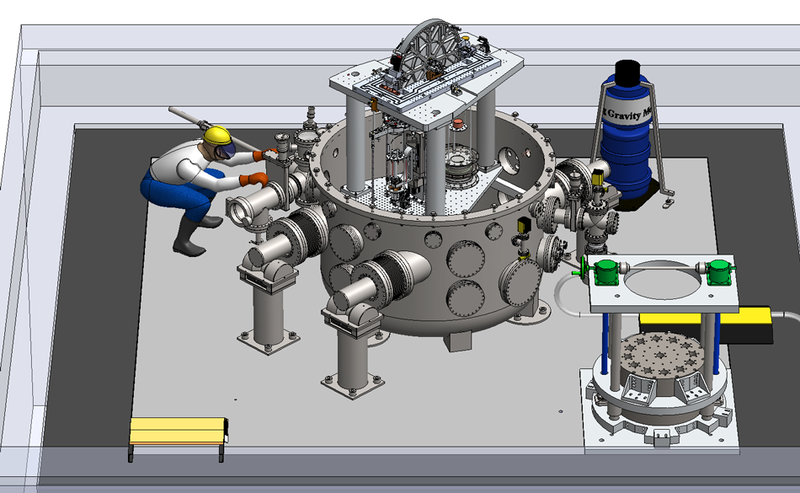 NIST-4 is being assembled in one of NIST’s advanced measurement laboratories, where it is slated for operation later this year. The device at right front is the permanent magnet and its mount. The blue object at the back is an absolute gravimeter. Source: NIST. NIST-3 has a superconducting electromagnet to provide the field. It requires liquid helium coolant to be refilled three times a week, thus making operating the instrument costly. In contrast, the NIST-4 will have a permanent magnet and will be easier to operate. The NIST-4 is expected to move into operation this year. “NIST-4 may come up with somewhat different values from what we got on NIST-3, which itself has varied over time,” Pratt said. For the first time, the back-end-of-the-line (BEOL) costs in IC production are projected to exceed 50% of total mobile system-on-a-chip (SOC) costs starting at the 10nm node. “BEOL-gate delay gap has (also) widened to be more than ~1000x at 10nm,” said Geoffrey Yeap, vice president of technology at Qualcomm, during a keynote at the recent IEEE International Electron Devices Meeting (IEDM) in Washington, D.C. In the last 15 years, Yeap said there have been only two new breakthroughs in BEOL interconnects—copper dual damascene and carbon-doped oxide low-k dielectrics. “BEOL RC performance as well as area/cost scaling are issues that require material innovation urgently and cost-effectively,” he said at IEDM. At IEDM, the University of Illinois, MIT and Stanford University described a novel approach to the problem. Researchers provided results with interconnects based on metallic single-walled carbon nanotubes (SWNTs), graphene, and graphene nanoribbons (GNRs). For some time, carbon-based materials, such as carbon nanotubes and graphene, have been studied as interconnect materials. They provide lower resistivity, higher thermal conductivity, and intrinsically higher current-carrying capacity than traditional copper interconnects. In the lab, researchers developed devices based on the materials. The devices were made on two underlying SiO2 thicknesses (70-90nm and 300nm) and on silicon substrates. All measurements were performed in air, with a breakdown oxidation temperature TBD ≈ 600 degrees Celsius. Researchers were able to reach current densities up to ~4 GA/cm2 for SWNTs and ~2 GA/cm2 for GNRs. “However, short carbon-based interconnects (e.g. L< 500nm) enter a quasi-ballistic regime where heat sinking is dominated by the contacts, and narrow GNRs are in an edge-limited regime (W <200nm), where thermal conductivity is dependent on device dimensions,” according to the paper. “In conclusion, we have found that reliability of SWNT and GNR interconnects depends fundamentally on their thermal dissipation rather than on electromigration as in Cu interconnects,’’ according to the paper. In the past, carbon nanotube plugs have been explored as interconnects in future devices. But the quality of carbon nanotubes grown at low temperatures provides lackluster performance. The National Institute of Advanced Industrial Science and Technology (AIST) has devised a way to conquer the problem. Researchers have developed a novel implantation process, which would deploy carbon nanotubes into holes like plugs, vias, and through-silicon vias (TSVs). AIST uses carbon nanotubes grown at high temperatures. Researchers also integrated the implanted plug with transferred multilayer graphene wires for use in developing all carbon interconnects. In the implant process, SiO2 film was formed on the silicon substrate. Then, catalysts were deposited on SiO2. The carbon nanotubes were then grown at high temperature, according to AIST. Metal such as gold was deposited on top of the carbon nanotube. Then, SiO2 film was dissolved using buffered HF to separate the tubes and the growth substrate. Then, the carbon tube film with metal was transferred onto a front-end-of-line (FEOL) wafer, according to AIST. A volatile solvent such as acetone was dropped onto the film and subsequently was evaporated. The film was in close adherence to the FEOL wafer, and carbon nanotubes were inserted into the holes. Finally, a CMP process was performed to remove the metal and carbon nanotubes outside the holes, according to AIST.